When I go out, I tidy myself up a bit: take a shower, put on some clothes, etc. 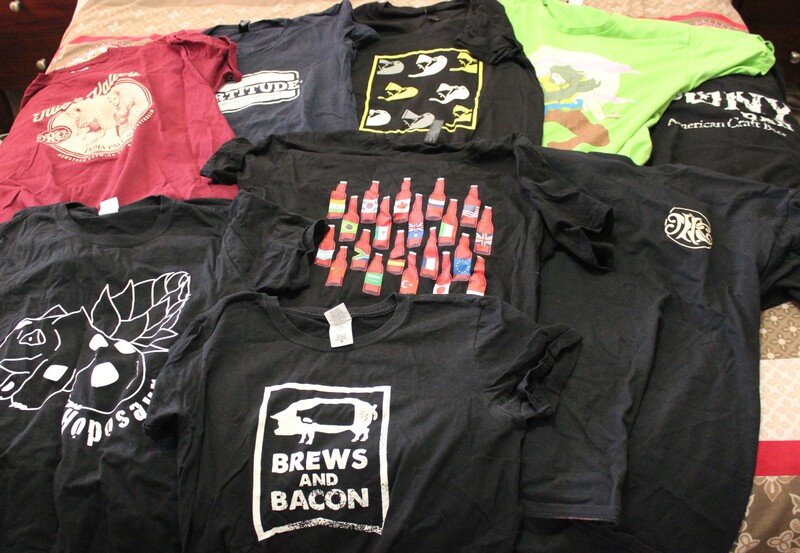 I tend to live in my beer t-shirts at the moment, and am growing a healthy enough collection to be allow for a shunning of all my other pleb tier “regular” t-shirts. The problem I’m noticing, however, is that I’m having a much more difficult time choosing which to wear and it’s causing me anxiety. To make matters worse, I’m attending a beer get together that will be filmed, adding more pressure to pick the perfect shirt. Lets go back a few years to when the only beer t shirt I had was my coveted ‘Pony Bar NYC’. Life was simpler then. I grabbed the only choice I had, wore it with pride, and enjoyed many nights out in it. It goes on like this for a little while until I close my eyes, grab a shirt, and hope for the best. T-shirt anxiety: it’s a legit thing. Surely, I’m not the only one? I only get worried about beer shirts when I pick my daughter up from school. Then I make sure NOT to wear one – I don’t think beer and primary schools go together. But it encourages biology, chemistry, and entrepreneurship. I see no issue with that. Aside from, well, the underage drinking.